That said, I don’t see us shutting the doors on email any time soon, so if email is the preferred communication for others for now, then I’m going to try to enjoy my email experience :wink:. I started working at OU in 2011, two years after finishing school here. The problem (or the benefit was… depending on your position) was that my OU email never actually got deactivated. I fell into the dark matter of the university servers, slowly taking up more and more space bit by bit. Email by email. Here’s the oldest email in my inbox. 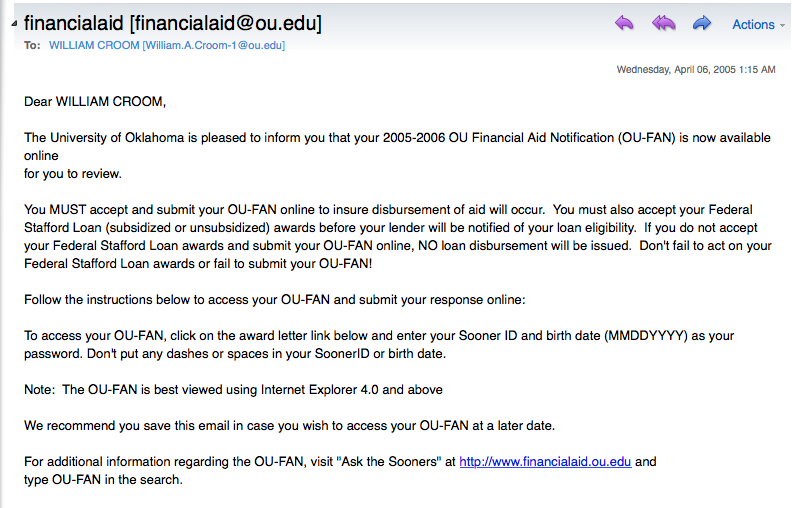 My financial aid award notification from April 6, 2005. And every email since then still sits in my very, very bloated inbox which currently tops 34,320. Needless to say, I’ve been needing an effective email solution for quite some time. OU is an Exchange campus and we rely heavily on the calendar integration so it appeared my options were limited. About two and half years ago, I deleted every possible remnants of Outlook desktop and moved over to using the online version of Exchange because having all my email stored on my hard drive was really slowing the machine. 1. Setup an Outlook rule to redirect your emails to a Gmail address. Exchange rule: All items sent to Adam Croom are marked as read and then redirect to Gmail. Although we are technically allowed to forward emails, as a state employee, it’s frowned upon that we directly forward our email to another server since emails are considered official records. So what I’ve done instead is simply setup an Inbox rule. This allows the email to still hit OU’s servers (and spam filters!) creating the record and then forwards it on. This is not a perfect solution as not all emails I receive are directed at me (for instance list-servs) but this is 98% effective. 2. Add your external email address as an alias to Gmail. Google got really smart when it integrated the option to allow you to send any email from your Gmail address via aliases. You just have to simply verify that you own it. I’m using Mailbox OS X beta. 5. Edit your account to use the alias. This is a bit redundant, and its unfortunate that Mailbox doesn’t automatically pull in your aliases, but you got to do this again. 6. Set your default address to be your Exchange email. Last, copy over your email signature and viola! You’re good to go. The process isn’t pretty, but the result definitely is! So far I’m really enjoying Mailbox. I still have to login to Outlook occasionally but mostly to dig through the archives for an old email. This is native to Gmail, but–holy cow–it’s nice to finally have. 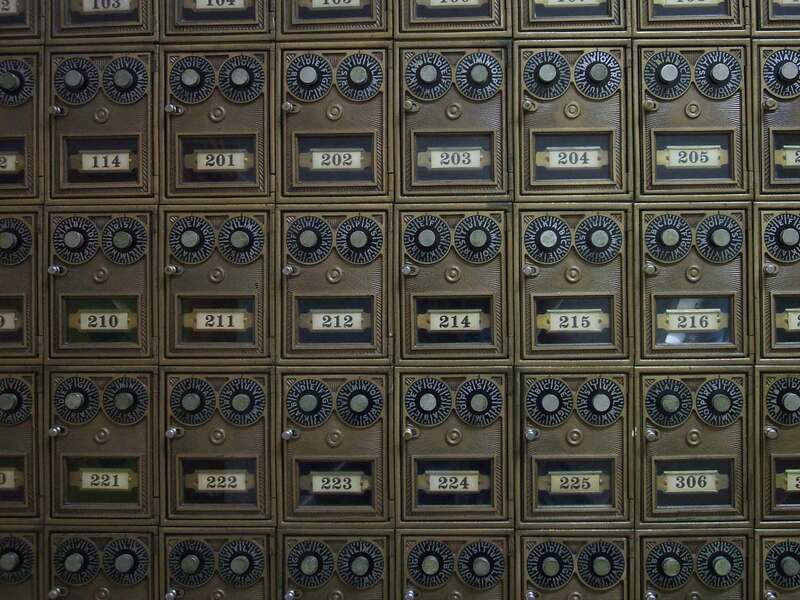 Reply to email (or don’t), archive it. Simple. Mailbox is really good at the email experience and has no frills. There is no advanced formatting panel, but I, for one, am very okay with that. Mailbox “New Message” dialogue box. Simple and clean. Here’s a screenshot of Outlook 2016 for Mac. Outlook 2016 for Mac. New year, same bulk. Just look at all those buttons. Flags, colors, folders, oh my. As organized as this may make you feel, it doesn’t scream efficiency to me. Mailbox gestures function similar to a mobile app. Archive > Swipe right. Schedule > Swipe left. That means spam gets archived without a click. Anyone who has ever accidentally marked something as spam in Outlook and then routed through a decision tree of adding that address to your address block to be blocked gets how convenient this is. I’m now looking at the various mobile solutions (which–ironically–Outlook seems to be strong in since their purchase of Accompli). I’m going to continue to evaluate this to see if I find anything that would pull me back to simply using Outlook for Web, but I honestly don’t think it’ll happen this time around. Zero is the new black!